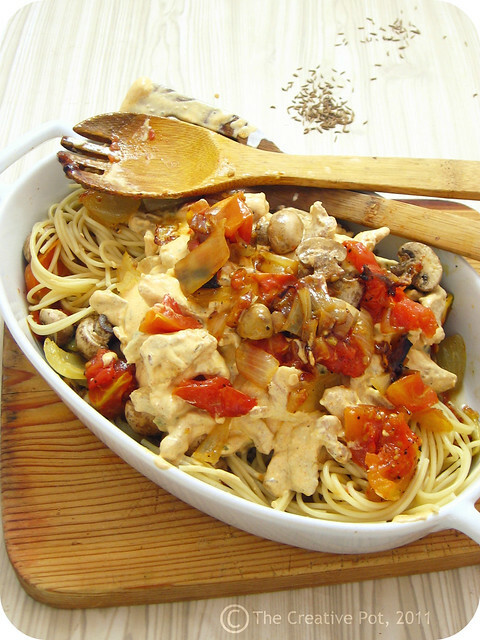 Firstly that the blatant strands of spaghetti in the photo is actually tagliatelle. I *meant* to use tagliatelle, I really did, but turns out I just had wholewheat spaghetti on hand. 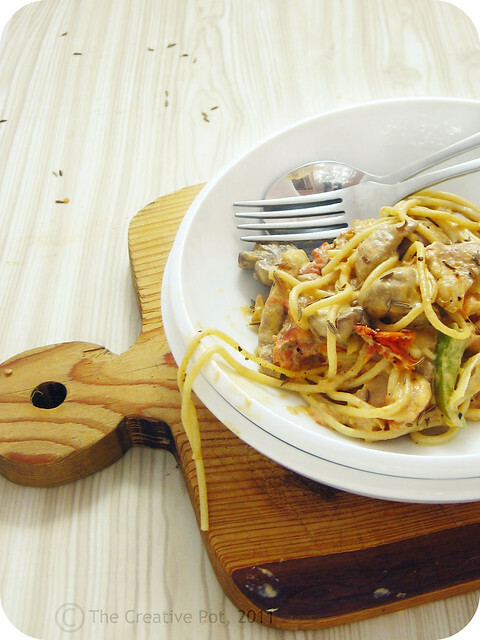 Which tasted fantastic to be fair, but Creamy Pork Spaghetti doesn't quite have the same ring to it, now does it? So, squint your eyes a bit to make those strands appear wider and more tagliatelle-esque. Secondly we need to transport ourselves to a tropical isle somewhere. Or at least a place where one's toes is not in a semi-permanent state of frozenness. Done? Great. The tropical isle bit is actually more to soothe myself, I'm sick and tired of complaining about the winter weather. But I felt guilty jetting off to a tropical isle (even it it's just imaginary) and leaving you guys home alone. Share the love and all that. My tropical isle dream also takes care of that nasty work thing that takes up all my week day time and of course it comes with perks like cocktails on tap, juicy pineapple wedges and mangoes dripping down your chin. Mmmm, I'm starting to think I should turn this fantasty into reality. Which would also necessitate procuring a sugar daddy to foot the bill. I doubt TheHusband will be impressed. Nope, best I stick to what I know - food. Strips of pork smothered in a paprika'd (yeah that's a word now) sour cream sauce, tossed with roasted rosa tomatoes (to fuel the summer fantasy you see) and the pasta of your choice. Preferably tagliatelle. Just 'cause it sounds pretty. But, if you happen to only have spaghetti on hand? Well, rest assured I won't be judging. Now dig in! 1. Arrange onion and tomatoes into a roasting pan, drizzle with olive oil, season with salt and pepper and roast for about 30 minutes at 180C (350F), add mushrooms and roast a further 10 minutes until mushrooms have browned and tomatoes and onions are beautifully soft and oozy. Remove, but leave the oven on. 2. After you've added the mushrooms, bring a pot of salted water to the boil, add the pasta to the pot and cook until al dente. 3. Meanwhile, heat about a tablespoon of olive oil in a medium saucepan over medium-high heat. Briefly fry the peppers until just soft, then remove from pan and set aside. 4. Add pork strips in batches to the pan, browning on all sides. Add garlic, paprika, caraway seeds and sour cream and add the peppers back in. Lower the heat slightly and cook over medium-low heat until the pork is cooked through. Adjust seasoning to taste. 5. 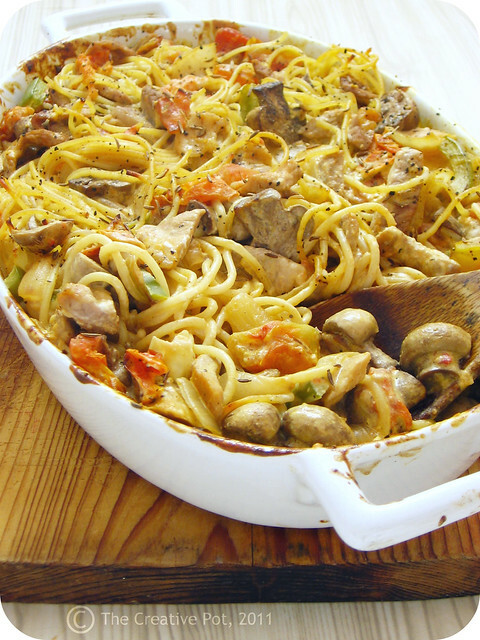 Transfer pasta into a large oven casserole dish, stirring through the tomato and mushroom mixture as well as the creamy pork mixture. Sprinkle with caraway seeds and place in the oven for 30 minutes (still at 180C or 350F). Serve warm. @Clement - Your comment puts a big old smile on my dial! @polkadot - I like the way your mind works..
Clearly you have your cooking mojo back. Good riddens, this is a meal for a family, but it looks utterly to-die-for! This really is one chock full of deliciousness dish! I love the sound of that paprika'd sauce! And should you go to your tropical isle, I'm coming with. No blogger left behind. What a great idea using sour cream - it looks scrumptious. I am sending some warm Ile Maurice sunshine your way (well just until we leave on Tuesday to come back home to a cold winter). Looks amazing, will definitely make this for hubby! oh wow! this is just beautiful! Oh wow.. this looks so delicious. Love the messy look in the photo. It's those freezing toes that get to me too - I'm thinking of keeping a hot water bottle under my desk! You've reminded me of my Mum's pork stroganoff, and also of a pork and apple dish I used to do and haven't for ages, if only I could remember where I got that recipe from... In the mean time this looks like a great idea for warming up toes and tummies! Hell, this looks STUNNING Marisa. Absolutely beautiful pix and a lovely recipe. Well done.